Home → History of Datz & Datz, P.A. History of Datz & Datz, P.A. Datz & Datz is a Jacksonville law firm specializing in family law and business law. The firm traces its origins in Jacksonville back three generations to the early 1920s. Founding partner Albert Datz’s uncle Nathan Schevitz was an exceptionally bright American-born son of European immigrants. Equipped with outstanding self-taught typewriting skills and diverse job experience, he gained employment with the Duval County Sheriff’s Office.In those days, Duval County had only two deputy sheriffs, an “outside” deputy and an “inside” deputy. The outside deputy served process while the inside deputy handled all the administrative duties. Nathan was the County’s inside deputy. He was quick to learn and soon knew more about writs, process documents and related matters than did most Jacksonville lawyers who came into the Sheriff’s Office. In time, most of those lawyers would come to consult with Nathan. Consequently, Nathan eventually decided to go to law school. After graduating from Cumberland University, he opened an office in Jacksonville and quickly became the beneficiary of referrals from the lawyers who had relied on him when he worked in the Sheriff’s Office. He also began handling criminal cases from many of the same sources and became known as a highly competent criminal defense lawyer. After Pearl Harbor in 1941, the state attorney in Jacksonville joined the United States Navy. His only assistant was elevated to the position of interim state attorney, but he was entitled to hire one assistant of his own. Nathan was appointed to that position by Florida Gov. Fuller Warren. At that time, the state attorney only prosecuted capital crimes and handled extradition matters and bond validations. The county solicitor handled all other criminal cases. Nathan became an expert in extradition and bond validation matters, and he also tried many first-degree murder cases. After World War II ended in 1945, the state attorney returned to his position and kept Nathan on as his part-time assistant. Nathan also kept working his private law practice where he developed a general clientele handling automobile accident injury claims, family law cases and criminal defense cases. In 1948, Nathan’s nephew Albert Datz graduated from the University of Florida School of Law and joined his uncle in the general practice of law. Nathan would occasionally be asked to represent someone in minor criminal cases. In order to avoid conflicts of interest, Nathan’s criminal cases were referred to Albert as a sole practitioner. However, in early 1950 Albert was appointed as one of the county’s four assistant county solicitors. In that capacity, he became adept at prosecuting criminal cases. The county solicitor was an elected official at the time. Albert’s boss was defeated by another Jacksonville lawyer in a 1952 election. As was the custom, the new county solicitor hired an entirely new staff of assistant county solicitors. Although Albert’s prosecuting attorney days ended, his career as a criminal defense attorney was just beginning. Albert chose to return to his private practice with Nathan rather than join a large trial firm. At this time, law firms could not incorporate and operate as proprietorships or partnerships. Nathan continued his dual role as chief assistant state attorney and part-time private practitioner, while Albert was the firm’s only full-time attorney handling criminal defense cases. The firm’s name became the Law Offices of Albert Datz. Criminal law dominated Albert’s practice and he began to represent many high-profile criminal defendants. Albert Datz continued his law practice under the name the Law Offices of Albert Datz for more than a decade. In 1964 Samuel Jacobson left his position as an assistant United States attorney to practice with Albert. Later, they formed the partnership of Datz & Jacobson, (subsequently incorporated as Datz & Jacobson, P.A., gradually expanding into other areas of civil law but maintaining their dominate fields of criminal defense and family law. The firm employed other lawyers from time to time. Ronald Dusek for instance, was with the firm for approximately 10 years. During some of that time, the firm was known as Datz, Jacobson & Dusek, P.A. Another of the firm’s lawyers was Charles Lembcke who later became a partner, resulting in the firm’s name becoming Datz, Jacobson & Lembcke, P.A. Lawrence Datz joined the firm in 1986 after spending three years in the State Attorney’s Office where he prosecuted everything from misdemeanors to major felonies. Still later, David Garfinkel began practicing at the firm. 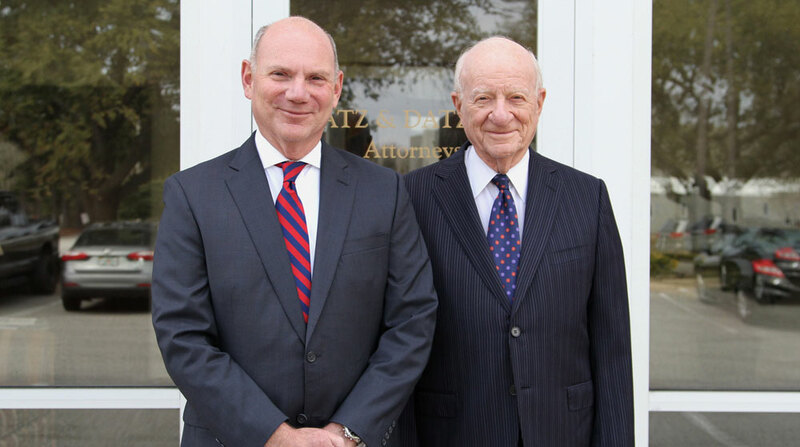 When Lawrence and David became partners of the firm, its name changed to Datz, Jacobson, Lembcke & Garfinkel, P.A. Several years after David left, Kenneth Wright joined the firm, and its name changed to Datz, Jacobson, Lembcke & Wright, P.A. That firm also employed other associate lawyers. Satisfied clients and other attorneys became the greatest source of the firm’s new client referrals. The public defender system grew throughout the 1970s and 1980s, guaranteeing indigent criminal defendants counsel. Consequently, the firm’s focus shifted to family law including divorce cases. In 2003, the members of the firm decided to reduce its size. Albert Datz and Lawrence Datz became the present firm of Datz & Datz, P.A., moving their offices from Downtown to Southpoint.